With my new found love of yarn I find myself lingering in the yarn section whenever I get the chance. 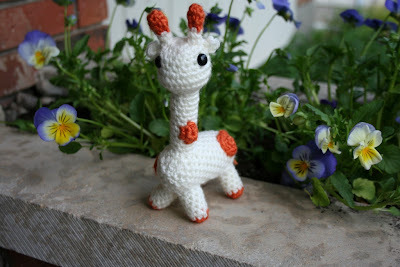 While there I saw this book of some cute amigurumi critters: easy crochet CRITTERS. I made a couple immediately with special requests from two of my darling kiddies. They turned out cute, however, I did not have the right colour yarn, I decided I better use the right colour next time I tackle one. Here is the first one I have completed with the right colours! My youngest is especially attached, and for the moment does not want to share it with anyone . I am almost done a lion, it looks pretty cute, I will be sure to update you when it is done! UPDATE: The lion can be found here.